The holidays are coming up and what better gift to give your friends and family than a jar of your homemade preserves! It’s an easy task if they live near you, a simple hand delivery will do. But what’s the best way to do it if they happen to live on the other side of the country? I thought I’d show you the way that I wrap and pack my jars for shipping (although certainly, this is not the only way) to help you get plan the best way to get those precious jars of raspberry jam through the mail unscathed. 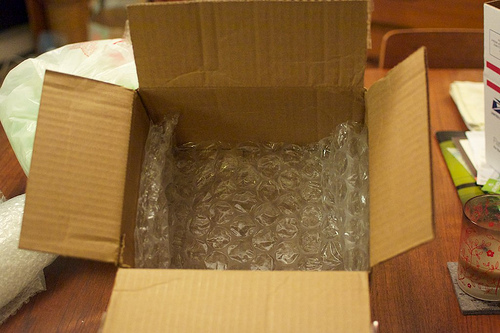 Start with a small to medium sized box (it depends on the size of jar you’re sending). Line the bottom with bubble wrap or some other sturdy padding (bits of old foam or eggshell mattresses work well here). 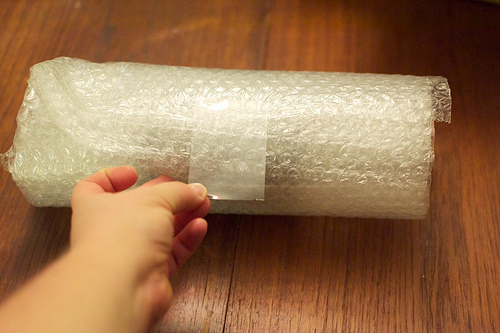 Lay out a long strip of bubble wrap and roll up your jar. If you’re using the small bubbles like the wrap pictured above, you want to encircle the jar in at least four layers. With the larger bubbles, two layers will do. Behold the wrapped jar. You should only barely be able to see the jar through the wrap. 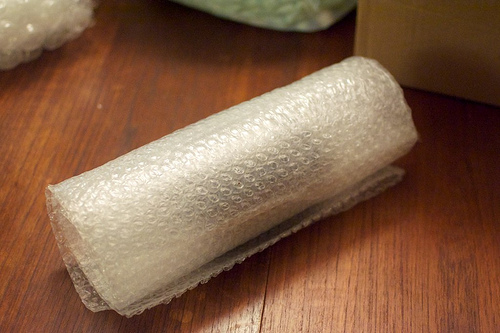 Secure the bubble wrap with tape, so that it doesn’t abandon its post during shipping. Fold the ends of the wrap and tape those down too. Think of this like the physics project so many of us did in the tenth grade, in which we designed enclosures for eggs that would keep them from breaking when dropped off the top of the ladder. The same principles apply here. A well-wrapped, well-secured jar. I always wrap glass to the point where I’d feel comfortable dropping it from a height of at least five feet onto my kitchen floor (which is a single layer of linoleum on top of solid concrete). Nestle the jar into the box on top of that primary layer of padding. Now, add more protection. I save all the bubble wrap, foam peanuts and other useful packing materials all year long, in order to have plenty of jar protection for the holidays. I beg you, do not use crumpled newspaper to pad your jars. I have learned the hard way that it is not nearly as effective at absorbing the bumps and bags that shipped boxes must endure. 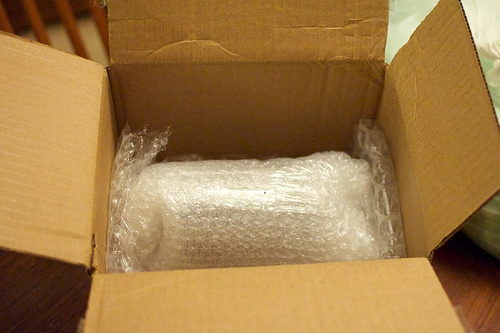 A final layer of bubble wrap to finish off the box. At this point, I tape the lid and check all the box seams and give them a layer of taped reinforcement, should they need it. If you are shipping more than one jar, I recommend looking into the flat rate boxes from the USPS. Jars of preserves weight quite a lot and if you are shipping more than one jar, the cost of mailing the box can quickly get expensive. With these boxes, you can ship as much as you can fit in there for a single rate. If you’re shipping multiple jars, do make sure to pad between them and pack them tightly enough so that they won’t shift during transport. And that’s it! My Jars Didn’t Seal! What Happened? My Jam Didn’t Set! What Should I Do? Just this morning I was thinking about emailing you about how you recommend shipping jars. Perfect timing! Thanks. One thing I found out years ago (the hard way) is that if you’re flying somewhere for the holidays, you cannot take your canned goods in your carry on with you – don’t lose your jam at security! It’s true! They consider jam a liquid and will confiscate it. When putting your jarred goods in your checked luggage, does the pressure change effect the jar/contents at all? I’m sure it does to a certain degree, but in my experience, never to the extent that it breaks the seal. Iive had jars pop thei seal and actually pop the glass jar due to pressure change in checked bags. I’ve had about 50/50 success rate on some trips so have kind if quit trying. I’ve wondered if they would do the same via mail. I use the priority boxes, too — learned that one the hard way one xmas. But I pack slightly differently, so here are more ideas! First, I put each jar in a ziploc bag so if the seal pops and it leaks, there will be some containment (this hasn’t happened yet, but still). And secondly, I pack the jars standing up, because if they are on their side, they’re more vulnerable to breaking. I found that you can pack pints in the large boxes with a layer of padding on the top and bottom, but if they are packed tightly, there won’t be any problems. Quarts have to be packed on their sides, though. I do try to pack jars upright, although I find that it’s hard to find smaller boxes that allow this. Sometimes I’ll put the label on the side, in the hopes that the post office will interpret that as the orientation. It’s true — if you only want to send 1-2 jars, it’s hard to find a good box. I tend to send only enough jars to justify using the Priority boxes. Timely! I’m making apple butter in the crock pot right now that I’m planning to send to relatives as gifts. Thanks for the overview! What a great idea! I was thinking about how to ship preserves. This is perfect. May I suggest that you put each jar in a small ziploc bag before rolling in the bubble wrap? I pack the way you do, but still, the postal gremlins have their ways. I was glad I use the ziplocs recently when a jar of my jam did break (a first) in transit. Saved a big mess for the recipient! I pack jars lik that in Ziplocs first as well. We like to send out Apple Butter for the holidays, and that can be a huge mess if they break. The recipients were very happy to see the mess all contained in a bag when one broke last year! The only reason I skip the ziploc is that I typically tape the bubble wrap around the jar well enough so that it’s fairly contained, even without a bag as the initial layer. 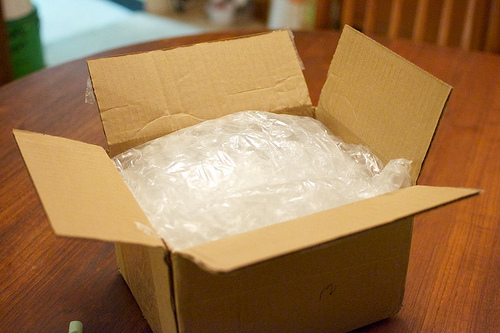 If you’re short on packing materials, check in at your local bookstore or gift shop to see if they have any extra packing materials left from shipments they have received. Another suggestion is to put out a post on Freecycle asking for packaging. the last box I shipped with two pint jam jars was $17.50 … if I’d had the time to re-pack with a flat-rate box, it would have been $10. also, seconding euginia’s rec of bagging before wrapping — I don’t feel half as much guilt saying there are no ::ahem:: liquids enclosed. Those flat rate boxes are brilliant in just this situation. They keep your costs down! There is no reason to lie about there being liquids! If you say yes, they just stamp it so the carrier knows to be gentle. I packed breakable things for years at a department store and one of the most important lessons I learned was PACK IT TIGHT! Any extra space lets things slide around and leads to breakage. Tightly packed boxes with padding (like the ones you showed!) make all the difference. Thank you — I was wondering if you could even send them in the mail or take them on a plane because of the pressure difference — so I will try this. Do you think I could even send a jar to Portugal? Sandi, you’d have to look into the regulations for Portugal. Every country is a little bit different. Very nice explanation. I am going to do something like this when I ship this holiday season. As an extra precaution, I put each jar inside a sealable plastic bag. That is not perfectly leakproof, but then if a jar DOES break, its contents most likely won’t get all over everything else in the box. Thanks for this! We’re visiting my in-laws for the holidays this year, and I’m debating just shipping their jars anyway, instead of trying to pack them in our luggage. Great tips. I’ll send this to my mom in hopes of getting her wild strawberry jam for my Christmas morning. Thank you for this!! I have 6 dozen jars to ship coast to coast for Christmas, and was looking for some instructions! I live in Alaska, so half the year our packages are subject to freezing. If you have the proper headspace on a jar of stiff preserves, then you should be ok because these don’t normally expand enough to break the jar or seal if they do freeze. Also, straight-sided jars and wide-mouths without shoulders are much less prone to breakage if they do freeze during transport. I wouldn’t mail syrups, pickles or produce packed in water/juice during the winter though. Most fruits preserved in alcohol won’t freeze unless you’re sending them somewhere really cold like here in AK where -40 is common. Have your shipped anywhere where freezing temps are an issue? I live in Minnesota and it could end up sitting in the cold somewhere for a day or more. I’m a glass carver and have been shipping glass, ceramic and crystal for years with only two instances of breakage. I pack in a box like you do but then for added insurance, I take a slightly larger flat rate postage box, put a thick layer of peanuts in the bottom, sit the gift box centered on top of that, and then pack peanuts tightly all around the sides and top of the inner box before closing and sealing the outer box. 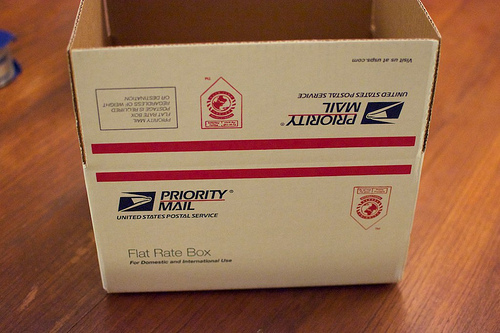 If you have too much for one flat rate box pack in two, you’ll still come out ahead on postage because the PO also has box size limits and if you exceed them the cost of shipping becomes pricey, fast. It may also prove cheaper to ship by UPS or FedEx. They all have shipping calculators on their websites so you can do a price comparison by weight and where your package is being shipped. Another way to ship items is thru bus parcel express offered by Greyhound Bus lines. Sending a parcel from Ontario to Alberta takes about three days, surface mail takes longer. Where do you get the wine bottle mailers? I have a case of jam to send from Ontario to New Brunswick! Are the Glass Canning Jars safe to send by air cargo when full & sealed? My understanding is that the air pressure in some airline cargo area’s fluctuates, so if the sealed jar is not strong enough, it would result in bursting / breakage. Please advise. Thank you. I’ve been shipping full, sealed jars for years now without any issue. However, I always seal the jars in ziploc bags in the rare event that they do burst. It hasn’t happened yet, but it’s always better to be safe than sorry. Hi There, this is my first time at making “Home made Apple-Butter” and I followed the direction about heating the jars before putting the apple-butter into them, they said that helps seal the jars. I have a quite question, I see many of you are talking about sending apple-butter or jams, But do you have to add ice when shipping so the apple butter does not spoil when being shipped from one state to another? I hope my question is not to silly this is my first time in ever making it. Thanks to anyone who answer’s my question. Cindy, did you process your canning jars in a boiling water bath after you filled them? If so, they are shelf stable and do not need to be refrigerated to be preserved. 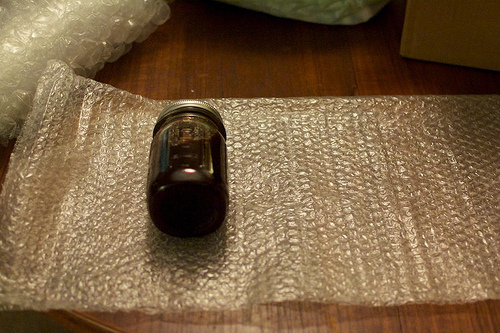 It’s those processed and sealed jars that this post about shipping is referring. Should I leave the rings on or take them off? I leave the rings on for travel and shipping. Any recommendations on packing them up to move across country in the winter? I’m worried about freezing temps as well as breakage. Thank you! I’m not used to shipping pickles, because in my home country India, all the people we want to send something to are nearby. And all of them make equally good pickles. So, never had to do this before. I’ll try this…! Maybe this has been addressed elsewhere, but doesn’t the USPS prohibit glass? Or is that a fairly recent thing they have been doing? What are your thoughts on shipping via UPS or FedEx, rather than the USPS? I don’t believe that the USPS does prohibit glass. They have some prohibitions on perishable food items, but properly home canned foods aren’t readily perishable, so they pass muster. Do you know where one might find these outlined shipping restrictions, particularly when it comes to cross border shipping? I’m located in Canada, trying to start a niche preserves business and I can’t seem to find info on what I am allowed to ship across the border. I actually just dropped a couple of quarter pint jars today, and was curious if you had any particular advice for things to look for to confirm safety. The rings were still on, so I think they bore most of the brunt, and the seal still looks and feels intact – anything else I should check for? Thanks so much! As long as the seals are still good after the fall, all is well. Whew – thanks so much! I have some home canned thick, but still liquid, tomato sauce that my daughter wants for Christmas. I am afraid that even though it is thick, it still might freeze. She also wants canned green beans. All of my canned goods tend to have more salt than most people use. Any thoughts? Hi, I just finally got my first couple sales on Etsy for my Strawberry Jam and I did not charge enough for shipping as I did not realize the costs. 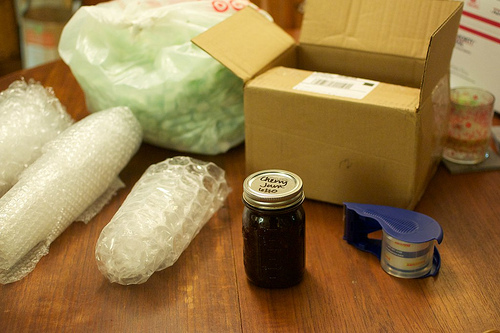 Thank you for this helpful article on how to package glass jams. I am using the USPS flat rate medium box for two 8oz jars of jam and it’s a little over $11 for shipping and I only charged $5 ea. for the Jam and $5.00 for shipping. Am I doing It right? I since changed my shipping to $12. It seems so high!! 🙁 I don’t want to turn away potential or returning customers. Christine, if you’re selling 8 ounce jars, you might find that it’s cheaper to ship them in regular boxes, not the flat rate ones. I’d suggest getting yourself a postal scale and doing some calculations to determine what will work best. I want to ship some salsa to friends. Shipping from California to Texas. I have sent it before but I boiled the salsa in mason jars and it completely changed the taste. Am I able to ship the salsa without “canning” it. and without it spoiling? Nope. There’s no way to preserve fresh salsa for shipping. I make homemade mustard with a lot of vinegar and sugar. My lids “pop” but I do not boil the jars after I put the mustard in them. I just pour the mustard in the freshly cleaned jars after the mustard is boiled/cooked and put the lid on tightly then loosen just a bit. My mom used to make the mustard and never boiled the small 8 oz jars after the mustard was put in the jars. I want to ship to friends across the US but not sure if I need a cool pack. We always put the mustard in the refrigerator when warm and the lids pop in the refrigerator. Amy, you just have to use your best judgment. I shipped jellies this year (wine and jalapeno) which were properly sealed and perfectly set up. When they arrived, the recipients told me they were liquid. Any ideas on what they should do? I suggested just letting them sit for a while. Yikes. It could be that the treatment during shipping broke the set. I’d suggest that your recipients put them in the fridge to see if that helps firm them up. Great article! I will agree with the other writers who say to put the jars in ziplock bags first. I sent my in-laws a bunch of homemade apple products and a jar of homemade sauerkraut. Guess which jar broke? Yeah their post office was so glad when they came to pick up their package but they were greatly disappointed. They live in rural Arizona and constantly have issues with their packages being mishandled and abused. Hopefully the carrier thinks twice about throwing around a box labeled as fragile. So this year more bubble wrap, smaller jars, and ziplock bags. Cool! Thanks! All I needed to know, quick, simple & to the point! Thanks again for the Information! oh my gosh guys DECLARE YOUR LIQUIDS! Jams, preserves, and pickles are perfectly acceptable to ship via USPS, it’s right on their web page and FAQ. If you declare it’s a liquid (or paste) they will mark and ship it accordingly (that’s one purpose of the bar code they scan at transfer stations). 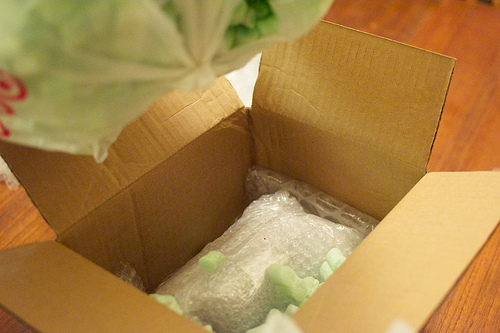 Fragile items are placed in different carrying containers and sacks. if you don’t, it’s likely the package will suffer rougher handling and it’s MORE likely to be broken. USPS also instructs to place each glass jar with 4-32 ounces be sealed within it’s own plastic bag. The instructions here follow their guidelines, just add the ziploc bag for each jar. They ask so that they can ship it the best way…not because they don’t want you to mail it. Just let them know you’ve followed their guidelines on packaging when you tell them you’re mailing liquids.